Another delightful email, especially for those who have kids. 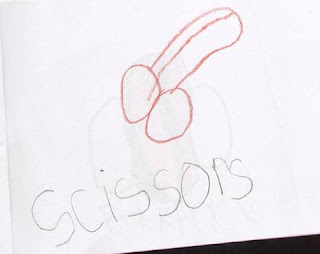 Quote from a mom: "This is my kindergartner's artistic rendering of a pair of scissors. I wonder what his teacher thought. I allowed myself just a small smirk when I saw it. 'I waited until he was out of the room before I started crying from laughing so hard. ' Well, of course they're scissors. If you know someone with small children or you are a teacher ... you will love this! I can certainly imagine seeing this one proudly displayed on the mother's fridge at home!